I should have saved myself the trouble and just phoned George in the first place. 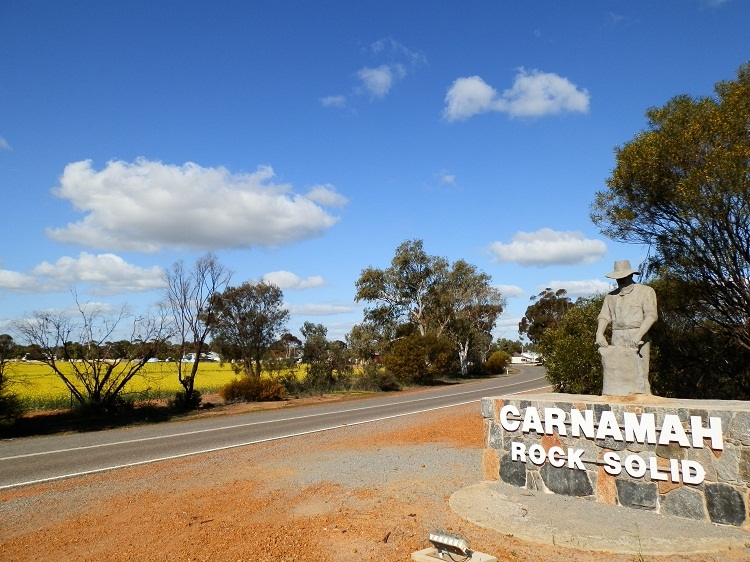 But I'd never visited Carnamah before, and didn't know what to expect. Although my mother was brought up there, she'd left over 60 years before. And her collection of childhood photographs were all monochrome, with many a little worse for wear after moving across Australia, overseas to Fiji and Papua New Guinea, then back again. So here I was, in the final stages of a 15,000+ kilometre road trip north from Adelaide, up through central Australia, west via Kununurra and Broome, then south to Kalbarri via Karijini National Park. 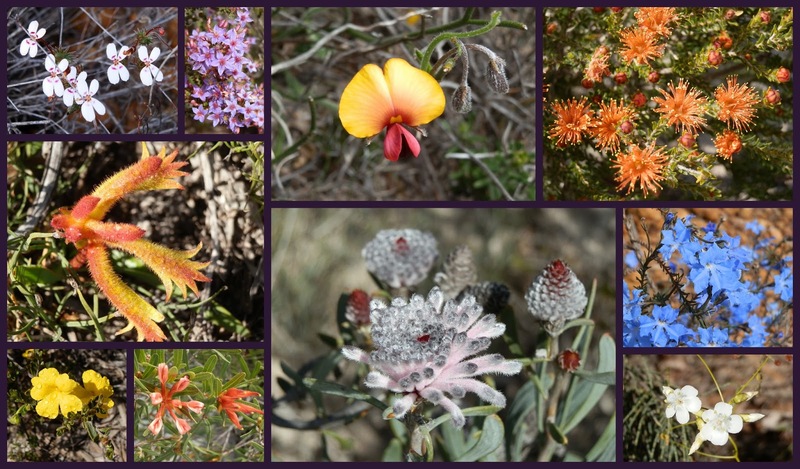 The country we'd travelled had been magnificent and the legendary Western Australian wildflowers even better than we'd expected. But… it was all downhill from here! 'Didn't your mother live around here somewhere?' 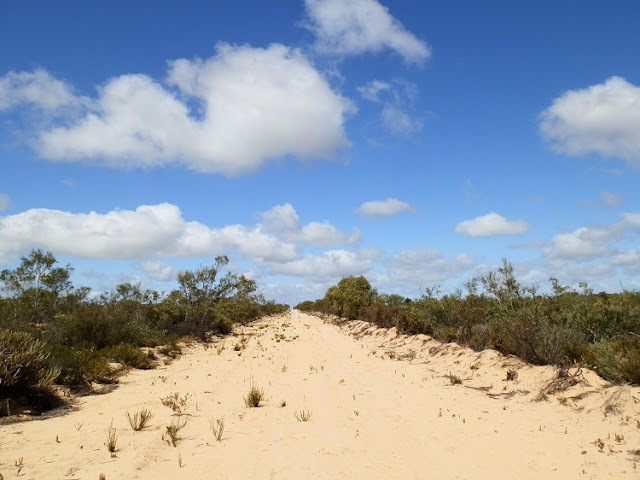 my partner Pilchard* asked, as he plotted a route taking us inland through southern WA and back to our base in South Australia. Of course. Carnamah. Our plans took shape. I googled 'Carnamah', found the excellent historic website and blog and trawled it for information about Mum's family. Carnamah's superb caravan park (FREE washing machines! Woo Hoo!!) made the decision to stay for a couple of days easy. 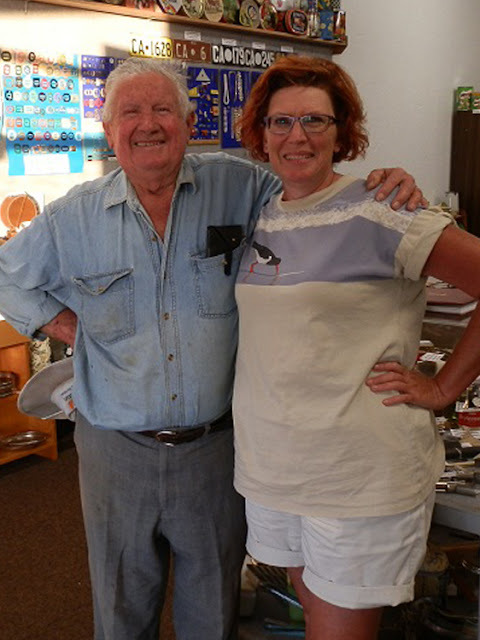 I mentioned my Carnamah connection to the manager who immediately suggested visiting the Visitor Information Centre. AND George – who apparently knew all there was to know about the region. Down at the Visitor Centre I mentioned my Carnamah connection to the helpful volunteer. 'Go visit George over at the historical society museum,' she suggested. 'He knows everything!' But, the museum only opened on Friday afternoons, and today was Monday. I decided not to bother. What would a bunch of strangers care about my association with a family long gone from the region? Back at the caravan park we had a visitor. Passing through Carnamah on his way home from holidays, he'd gone to the Visitor Centre about 10 minutes after I'd spoken with the volunteer and asked about Mum's family. His brother was interested in their family history so he'd made the Carnamah stop to find out what had happened to them. Family history? Well ... YES! Turns out he's my mother's cousin! So I gave him a potted version of the family fortunes over the last few decades. He gave ME George's phone number! 'Apparently this guy knows everything,' he stated, adding that he wouldn't have time to catch up with George before leaving the next day. Later that evening I rang Mum for her birthday (another coincidence) from my surprise location with my surprise news about my surprise meeting! 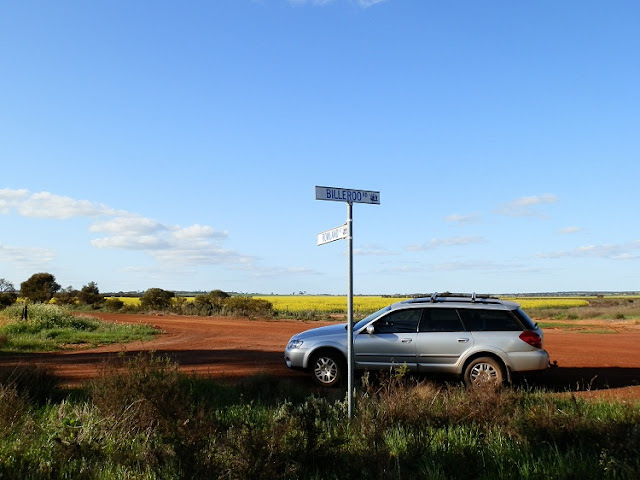 She didn't at first believe I was actually in Carnamah, but as I questioned her about the school they attended (Billeroo) and the farm they owned (three miles past the Billeroo school), I felt the first stirrings of an actual connection with this small town. That night I had a look at the Carnamah blog and left a comment asking how to get to the Billeroo school. The reply came quickly. Contact George. Because George knows everything about the area! 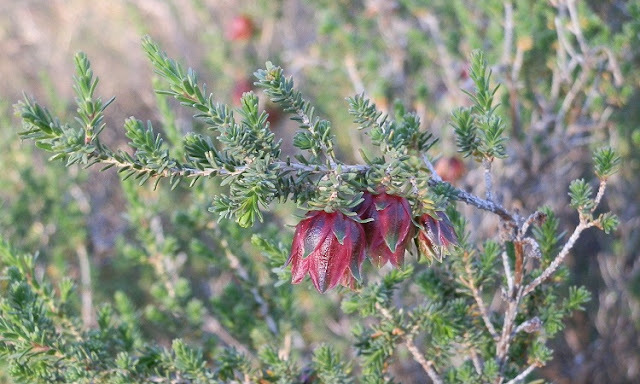 But the next day as we toured the area, sighting some of the best wildflowers we'd ever seen including endemic Carnamah Bell, and the sought after Wreath Leschenaultia, I decided against contacting George. Why would he care about my family history from so long ago? 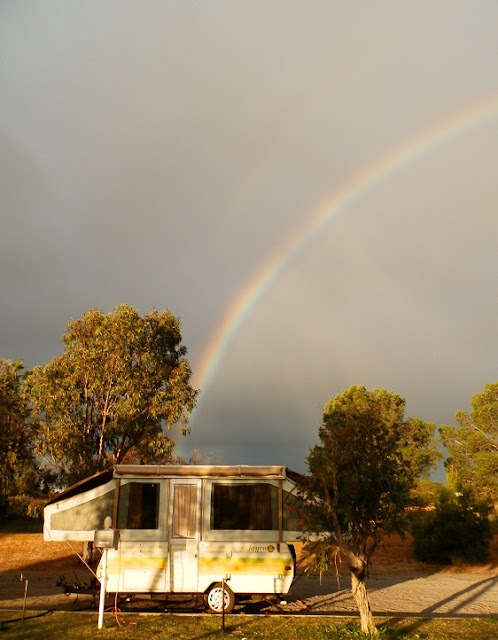 But that evening as rain threatened, a rainbow showed the pot of gold to indeed be right here, in Carnamah. And another chance meeting – this time an ex-local staying at the caravan park on her way home from a trip north. She suggested we wouldn't regret a visit to Tathra National Park – and if my mother WAS from the area, she'd appreciate the magnificent wildflowers to be found there too. Coincidence? Maybe. So we decided to stay another day. I couldn't walk more than a few steps in Tathra National Park without taking another wildflower shot. As the rain clouds blew away to reveal the magnificent countryside in all its scenic splendour, I imagined that young woman of yesteryear who had known and loved all I could see – who, reportedly, I resembled greatly. So I changed my mind. Back in town, the Visitor Information Centre volunteer remembered me. And this time I knew the name of Mum's school. She wasn't sure where it was. But she knew that George would know! And, another coincidence. The historical society's museum was preparing for a grand opening later in the year. The volunteers were busy. So even though it wasn't Friday, the museum was open! As I entered the beautifully laid out and well organised little museum, I was greeted by Jill Tilly and Bridie Evans. It turned out that Bridie actually knew Mum! We chatted briefly about the connection - then I asked about the Billeroo school, and told them of my family connection to the area. 'Wait,' said Bridie. 'I'll run and get George!' And off she went. Jill explained that George knew everything about the area and showed me the Billeroo school folder. I glanced through it while we waited. Photos, some I'd seen before in my mother's album, showed students and teachers. Correspondence with the education department discussed setting up a school in the district, the volunteer families who donated time and materials to construct the building, and a far away government agency who expected to get it all for nothing. And then closed it down a few short years later. My mother was its last teacher. How could I NOT visit the site? And then I met George. George indeed DID know everything! How? 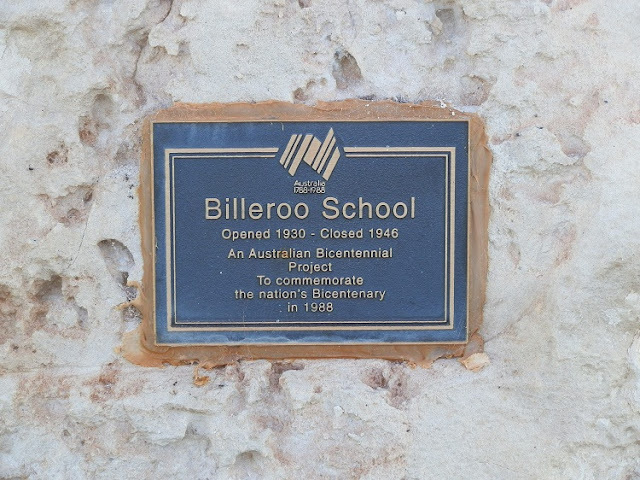 Because he'd attended the Billeroo school so of course knew exactly where the monument was. His farm was right next door to my family's farm, so he knew all of them very well. His best friend was my uncle. And he's now the historical society's president who, along with other volunteers have spent countless hours ensuring that the region's history is preserved, ready and waiting for people who want to find it. For people like me. In Carnamah, all roads led to George. And instead of nothing, I found a richly detailed and fascinating local heritage proudly preserved as if it were waiting just for me. A heritage that strengthens and confirms my connection with this region and town. A heritage that I'll be contributing to just as soon as I can get hold of my mother's old photos and scan them for the virtual curator. And a heritage that includes my new friend George. Marion Halliday's alter ego is Red Nomad OZ. Under that guise, she travels throughout Australia, takes countless photographs and records her experiences on her blog Amazing Australian Adventures. Go visit RIGHT NOW!!! Thank you for the opportunity to show the effect of an excellent Historical Society from the perspective of a random user! The society is a resource which everyone involved should be very proud of - and I'll get those photos scanned as soon as I can! Thanks again for the great blog post and for your supportive and appreciative words. Our thanks in advance for digital copies of your Mum's photos - we can't wait!